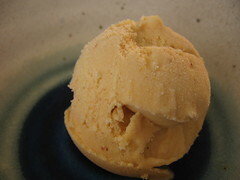 Spiced Pumpkin Ice Cream - Do You Know The Muffin Man? Notes: Using fresh pumpkin puree, I made a double batch of this seasonal ice cream for a mini-potluck at work where both tubs were quickly consumed. The brown sugar and spices gave it a deep, rich flavour (although a bit more of the spices wouldn't have hurt). I particularly liked the subtle heat from ground ginger and white pepper. A nice, once-a-year treat.